I had the pleasure of sailing on the Carnival Dream for the Dec.26 th departure for 8 nights out of New Orleans. I spent two days post cruise in the beautiful city, at the centrally located Westin New Orleans hotel. This was a perfect location. We were within walking distance to the shopping centres, numerous fabulous restaurant & right close to the cruise ship terminal. Check in was non-eventful as there were plenty of agents to check the large group onto the ship. We then sailed out around 4pm, as it took approximately 4 hours to sail to the ocean down the Mississippi River. 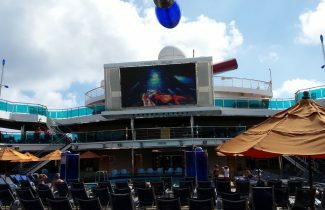 Traveling aboard the innovative Carnival Dream (one of the largest vessels in the Fun Ship fleet) was amazing! It has elaborate facilities for children of all ages & high-occupancy cabins. 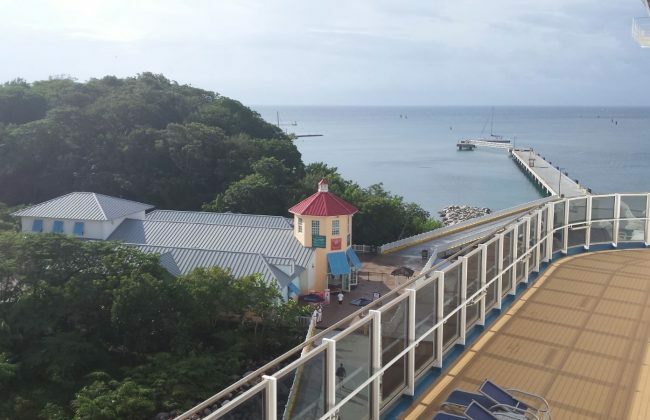 Among the ship’s highlights are the miniature golf course, WaterWorks Aqua Park, Punchliners Comedy Club & Brunch, as well as several lounges/bars throughout the ship. Sit back and enjoy a featured production from Encore, or one of the daily Fun Ship films by Pixels Photo Gallery. There are three children’s programs which include Camp Ocean for ages 2 – 11, Circle C for ages 12 – 14 & Club O2 for teens 15 – 17. While the kids are enjoying all that these programs have to offer, the adults can enjoy their break with a visit to the Jackpot Casino or the RedFrog Rum Bar. Also, visit the elaborate, family friendly Cloud 9 Spa, the resort style pool, or one of the several scenic whirlpools extending beyond the ship’s beam. For a little privacy, adults on board can also enjoy Serenity, an adult-only retreat. In addition to a variety of traditional staterooms, the Dream offers a category of cove balcony staterooms located closer to the water line to give guests an up-close view of the sea. Our cabin was located on the sixth deck, mid ship over looking the atrium. This is where there were numerous live entertainers every night. We had two peaceful days at sea which were extremely relaxing as we were both exhausted. Christmas is a crazy time of year!!! Our first port was Costa Maya from 8:00 am until 6:00 pm. This is a beautiful port area with a wide selection of shopping, food & drinks. It’s exceptionally clean & well designed. We were not pressured to buy in this area like you may be in other areas of Mexico & the Caribbean in general. Our next port was Mahogany Bay. 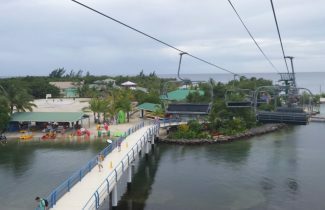 Unique to Mahogany Bay is a new chair lift system that takes cruise ship guests from the welcome center to the beautiful Mahogany beach, a 10 acre private island featuring an 825 foot long white sand beach with a beach volleyball court & a myriad of water sport opportunities. The cost of riding the chair lift is $14.00 for Adults & it’s good for all day. (I stayed on it for numerous trips back & forth). 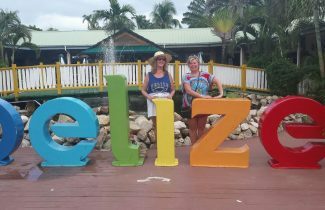 Next port is the port of Belize City. Gorgeous beaches & crystal clear water make it a perfect place for diving & snorkelling. There is an almost unbroken line of reefs & caves extending for 150 miles along its coast that make up the longest reef system in the Western Hemisphere. Last port was the port of Cozumel, Mexico. Cozumel is a major port that welcomes more than one million cruise passengers each year. It does have a non-touristy side: only one third of the island has been developed, leaving large stretches of pristine jungle & sandy beaches basically untouched. We then had one more “sea” day to sail back to New Orleans. We had time to soak up the sun & relax with a glass of wine. 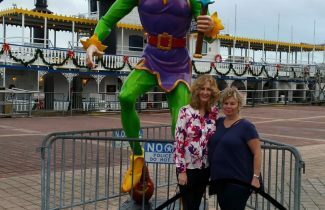 We arrived back to New Orleans early morning. Disembarking was also quite uneventful. Then, back to reality & work!! 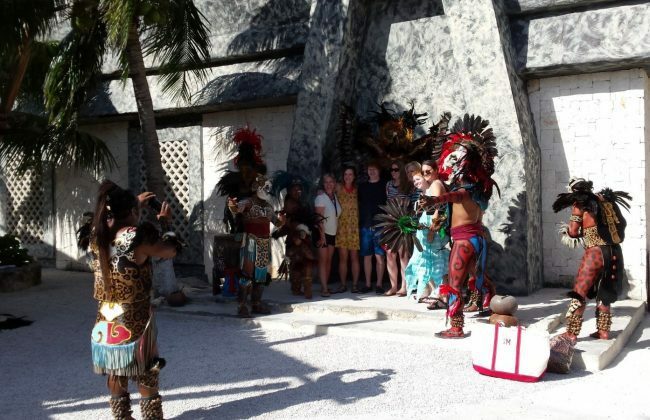 I thoroughly enjoyed the itinerary, entertainment, ports of call an incredibly attentive staff.